Texas. Most of the time, that's the only word we need hear to envision an endless land peppered with outlaws, beautiful women and heroic derring do. England had knights, Texas has them, too. We call them cowboys. The many personalities in Texas's past can keep writers busy all day every day chronicling its colorful history. But what about the little guy, the everyman, the fella next door who never robbed a bank, drilled for oil, or drove cattle? More than anywhere else, I'd venture to say that, in Texas, everyone has a story. Take, for instance, J.W. Epperson, born about 1854, died about 1929. Mr. Epperson, a carpenter by trade, lived at 1601 First Street in Brownwood Texas, though he wasn't always a carpenter and he didn't always live in Brownwood. He was once a newsboy and lived in Washington DC. This does not sound all that memorable except for one fact: He was selling newspapers at Ford's Theatre on the night of April 14, 1865. 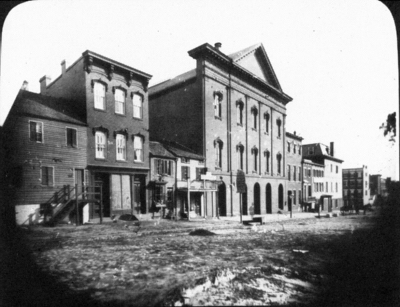 On that tragic night, three newsboys, called "newsies," had posted themselves near the entrance of the theatre to sell their evening papers to the great and mighty of Washington society entering Ford's. The newsies had a very good night. Two of them had sold all their papers and the third, Epperson, had only one left, when a tall, lanky man in a stovepipe hat and long black coat stopped to buy it, smiling at the newsboy. It was none other than Abraham Lincoln. Secretary of War, Edwin M. Stanton, wanted a newspaper, too, and was "slightly annoyed" because there wasn't a copy left for him. The President and his wife, Mary Todd Lincoln, who wore a black and white striped silk dress with black lace veiling over her hair, were accompanied by a young couple, Major Henry Rathbone and Miss Clara Harris. They were late; the British comedy, "Our American Cousin" had already begun. Mr. Lincoln was no stranger to Epperson, for he had first seen the gangling figure of the future chief executive several years previously in Illinois. Mr. Lincoln spoke to a few countrymen at a little crossroads store, and among his listeners was little Epperson. As Epperson and the other newsboys, McClelland and Dougherty, stood staring after President Lincoln, they decided to buy tickets themselves in hopes of getting another glimpse of the President. For the price of a balcony ticket, they got a lot more. The little newsies became eyewitnesses to one of the most grievous events in the history of the United States. As the play progressed, the First Lady sat very close to her husband, her hand in his. She whispered to him, "What will Miss Harris think of my hanging on to you so?" The president replied, "She won't think anything about it." Those are the last recorded words of Abraham Lincoln. 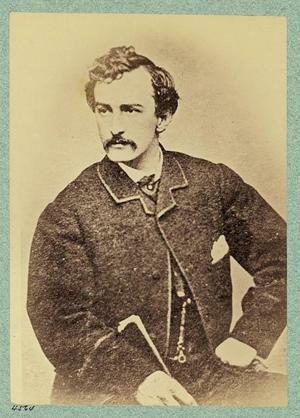 "There's that crazy fellow," whispered one of the newsies as he spied John Wilkes Booth. Booth himself had purchased a paper from Epperson earlier that night. Epperson usually sold papers to Booth and other actors regularly. At the loud report of a shot fired, the eyes of the boys, and everyone in the audience, turned to look up at the President's box. They saw Secretary of State Stewart struggling with Booth, saw the "demented actor" thrown into the lap of a woman, pick himself up, jump to the stage, and hurry through the back of the theatre, limping on his injured leg. Epperson left the balcony and "squirmed his way to the scene of the excitement." Many years later, Epperson recollected the horrific event to the Brownwood News. When the fatally wounded president was carried out of the theatre across Tenth Street and to the Petersen boarding house, the newsboy followed. Mrs. Lincoln momentarily lost sight of Mr. Lincoln and yelled out, "Where is my husband? Where is my husband? Why didn't he kill me? Why was I not the one?" The president was carried into a room rented by William T. Clark, who was out of town. Being so tall, Mr. Lincoln had to be placed diagonally on Clark's bed. Mary Lincoln stood in the doorway along with Laura Keene (star of Our American Cousin) and Clara Harris. Mary entered and bent over her husband's unconscious face covering him with kisses, calling him by endearing names, and begging him to speak. As the doctors began their examination of the president, Mary was asked to wait in the front room of the Petersen House. The death watch began. Mary kept a night-long vigil, alternately crying and making forays from the front parlor to the room where the president lay. Dr. Marshall, the president's physician, required an errand boy to run to the drug store and spied Epperson, standing in the street, wide eyed. All night long, young Epperson ran to and fro bearing medicine for President Lincoln. All his running was to no avail, for President Lincoln died the next day. The President continues insensible and is sinking. Secretary Seward remains without change. Frederick Seward's skull is fractured in two places, besides a severe cut upon the head. The attendant is still alive, but hopeless. Maj. Seward's wound is not dangerous. It is now ascertained with reasonable certainty that two assassins were engaged in this horrible crime, Wilkes Booth being the one that shot the President, and the other companion of his whose name is not known, but whose description is so clear that he can hardly escape. It appears from a letter found in Booth's trunk that the murder was planned before the 4th of March, but fell through then because the accomplice backed out until "Richmond could be heard from." Booth and his accomplice were at the livery stable at six o'clock last evening, and there left with their horses about ten o'clock, or shortly before that hour. 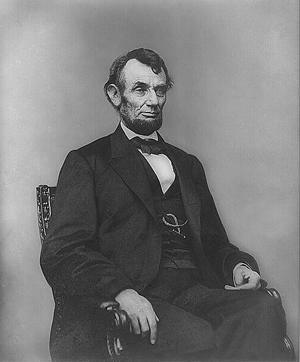 Abraham Lincoln died this morning at twenty-two minutes after seven o'clock. With so little information, it's no surprise that newspapers with journalistic detail were in demand. Epperson was so exhausted after a sleepless night that, by noon, he could hardly stand. He slept a while, then resumed selling his papers. "Those were great days for the newsboy," Epperson recalled many years later to the Brownwood News. Referring to the Civil War, he added, "After a battle, a paper would sell from five cents to a dollar, depending on just how excited was the citizenry." "Booth always acted queerly,:" recalled Epperson, "and was generally accepted as what we now would call a nut. Mrs. Surrat [sic] and the other plotters picked him for actual commission of the crime for this reason." "About ten days ago, I retired very late. I had been up waiting for important dispatches from the front. I could not have been long in bed when I fell into a slumber, for I was weary. I soon began to dream. There seemed to be a death-like stillness about me. Then I heard subdued sobs, as if a number of people were weeping. I thought I left my bed and wandered downstairs. There the silence was broken by the same pitiful sobbing, but the mourners were invisible. I went from room to room; no living person was in sight, but the same mournful sounds of distress met me as I passed along. I saw light in all the rooms; every object was familiar to me; but where were all the people who were grieving as if their hearts would break? I was puzzled and alarmed. What could be the meaning of all this? Determined to find the cause of a state of things so mysterious and so shocking, I kept on until I arrived at the East Room, which I entered. There I met with a sickening surprise. Before me was a catafalque, on which rested a corpse wrapped in funeral vestments. Around it were stationed soldiers who were acting as guards; and there was a throng of people, gazing mournfully upon the corpse, whose face was covered, others weeping pitifully. 'Who is dead in the White House?' I demanded of one of the soldiers, 'The President,' was his answer; 'he was killed by an assassin.' Then came a loud burst of grief from the crowd, which woke me from my dream. I slept no more that night; and although it was only a dream, I have been strangely annoyed by it ever since." Both McClelland and Dougherty were already deceased in 1929 when J.W. Epperson relayed his story to the Brownwood paper, making him the last living witness to an historic event of monumental proportions. It's fitting here to paraphrase Will Rogers by saying that "We never met a man we didn't find interesting � if he's from Texas ."